The folks at Showtime are very happy campers. 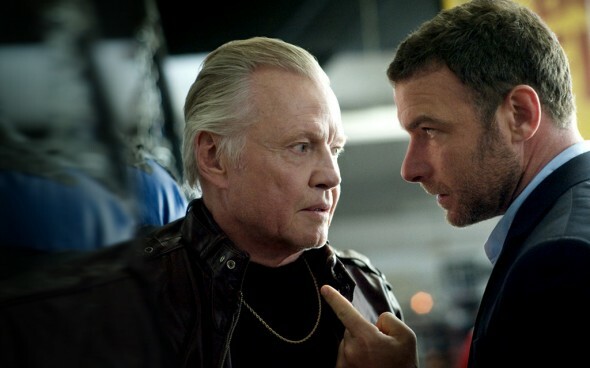 Sunday’s debut of Ray Donovan drew the best ratings for an original series premiere in the history of the cable channel. What’s more, the final season opener of Dexter delivered that show’s highest-rated premiere in its eight season history. The momentum and growth of SHOWTIME(R) original series continued last night with the record breaking premiere of RAY DONOVAN, starring Emmy(R) and Golden Globe(R) Award nominee Liev Schreiber. And, with the eighth and final season premiere of DEXTER at 9 p.m.
RAY DONOVAN delivered the network’s highest-rated original series premiere ever with 1.35 million viewers at 10 p.m., besting all other SHOWTIME freshman comedy and drama series including HOMELAND’s blockbuster premiere in 2011 by 25 percent (vs. 1.08 million). The series delivered 2.22 million viewers for the night, the highest-rated freshman series night of any SHOWTIME series to-date, up a staggering 61 percent versus the season one premiere night for HOMELAND (with 1.38 million viewers). RAY DONOVAN was sampled across multiple platforms in the two weeks leading up to its premiere last night. Within that period, an additional 816,000 SHOWTIME subscribers sampled the series on SHOWTIME ON DEMAND(R) and SHOWTIME ANYTIME(R), bringing the RAY DONOVAN series premiere total to 3.04 million viewers. Additional online sampling data will be available in the upcoming weeks. The eighth and final season premiere of DEXTER continued to break records, ranking as the series’ highest-rated premiere ever, a record which the show continues to break season after season. DEXTER’s debut last night delivered 2.5 million viewers at 9 p.m., up four percent vs. its season seven premiere (2.4 million). The series delivered 3.2 million viewers for the night, up five percent versus season seven (3.04 million). In seasons past, 64 percent of viewers tuned in to DEXTER after its Sunday 9 p.m. episode – watching replays, via DVR, On Demand and authenticated viewing. What do you think? Did you watch either of these premieres? Were they worth your time? I’m saying this, because I know Dexter was gonna be one of those series’ that I was gonna watch once it was over. It just really seems dumb for them to for them to confirm the eighth season was the last so early but confirm the eighth season of Weeds was gonna be the last season, when half the season was already shot. Now it’ll only be eight seasons long, when I watch the whole thing.